A Sandusky couple is facing charges after they staged a fake murder scene with ketchup inside of a bathtub and sent photos to relatives on social media. Police were called Thursday at 9:21 p.m. to a home in the 600 block of Meigs Street after receiving multiple calls regarding a possible homicide, according to a police report. Officer discovered Nataleigh Schlette and Micah Risner, who both said the incident was "joke" and a "hoax." Schlette, 25, and Risner, 29, used Facebook Messenger to send a photo depicted Schlette as a victim of a homicide, the police report said. Both were charged with inducing panic. They pleaded not guilty to the charges Friday. But Sandusky Police Chief John Orzech said the joke pulled by the couple was not funny and caused resources to be wasted. "All the other areas of the city essentially left unprotected at that moment," Orzech told News 5 during a Friday afternoon interview. The couple told police they cleaned up the bathroom before they arrived. "The officers were rather upset about it, once it calmed down and they found out the story," Orzech said. The point of the hoax, Orzech said, citing Risner: "Was a ploy to get a sister home who they thought had stolen money from them," he said. News 5 went to the Meigs Street home, to see if the couple wanted to share their side of the story. 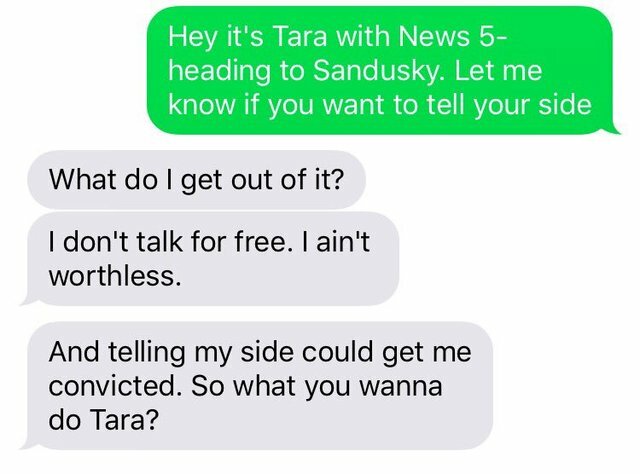 Risner responded to our Tara Molina's interview request via text "What do I get out of it? I don't talk for free. I ain't worthless. And telling my side could get me convicted. So what you wanna do Tara?"